While most watched DeRay McKesson, Baltimore native and #blacklivesmatter activist, deliver these words in April 2015 (describing the unrest that occurred shortly after Freddie Gray’s funeral through the screens of their television), my students and I watched it live while on the front lines of the unrest in Baltimore; our school located just a few, short miles from both Baltimore’s City Hall and the Sandtown-Winchester community. During the unrest, we also happened to be analyzing Shakespeare’s The Merchant of Venice in preparation for our production of the play. One of the formative assignments that my seniors complete while we are in our “second-draft reading” of the text—a deeper, analysis driven reading of the text that occurs after we have read it for plot— is to have them explore LUNA (the Folger’s digital image database) and search for various renderings of the play’s main characters. We observe costuming, posture, proxemics, props, and other items to inspire the portrayal of our characters, unearth possible ideas for set design, and consider the socio-political context’s impact on various productions. I’ve done this lesson for the past three years and the Folger’s rich (and growing) LUNA digital collection is certainly a reason for me to continue. 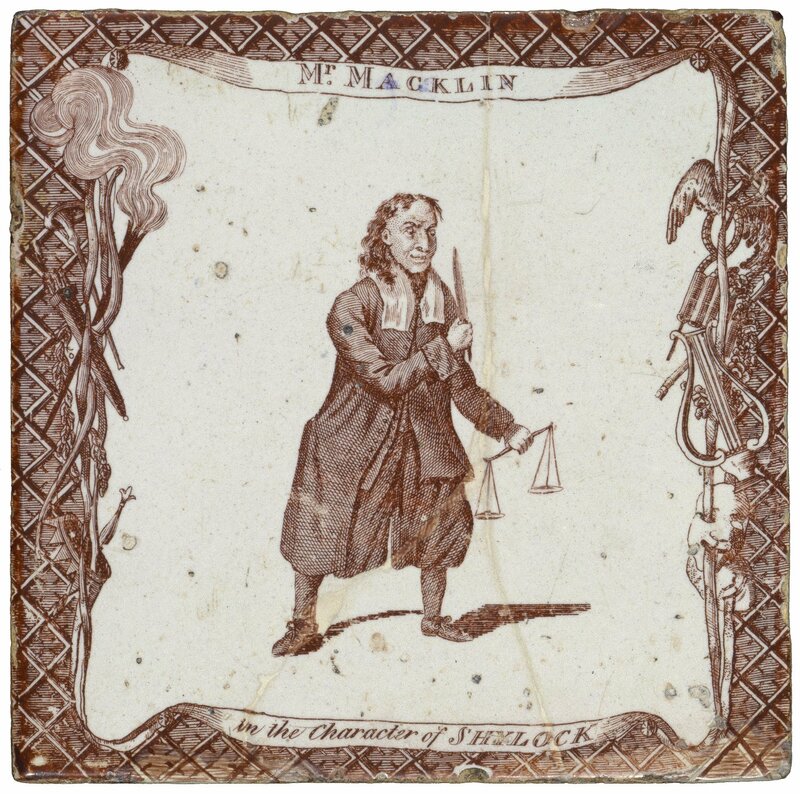 We careen through images of Charles Macklin’s 18th century portrayal of Shylock as a merciless miser and artist E.G. 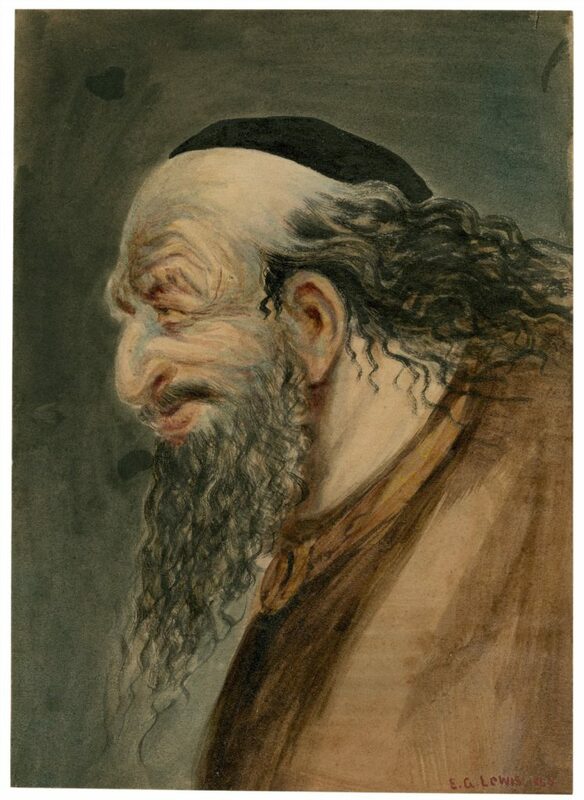 Lewis’ 1863 painting of Shylock that portrays him as a cruel caricature of Jewish culture—an archetypal portrayal of Jews common during Elizabethan theatre. 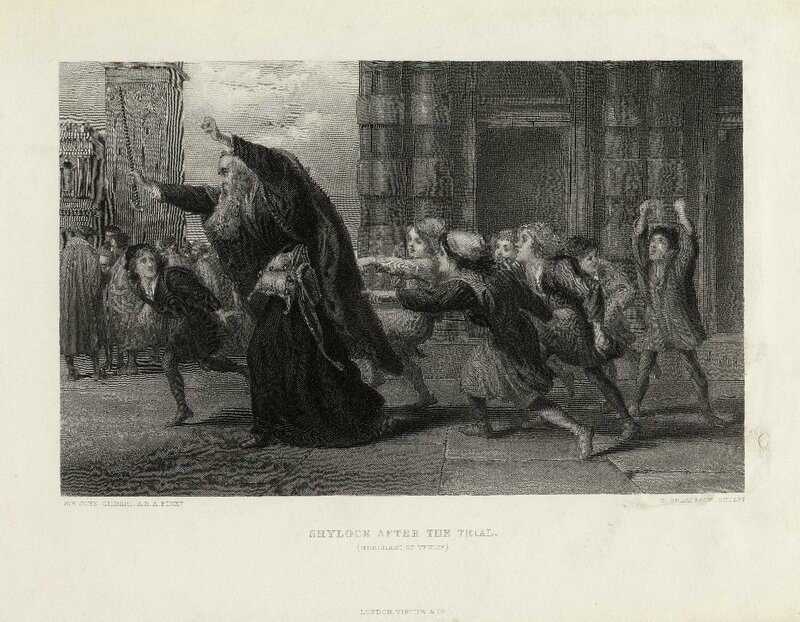 A final, familiar image that the students select is John Gilbert’s visceral painting of an angry Shylock storming out of the courthouse after Portia’s verdict stripped Shylock of his religion and wealth in Act IV, scene i. Usually students are very quick to write this image off and merely describe it as a visual rendering of Shylock’s rage after he loses his wealth. However, in 2015, my seniors, immersed in the aftermath of Freddie Gray funeral, saw this image differently. The other LUNA images that positioned Shylock as a merciless monster felt so limited in attempting to capture the scope of that character and his pain. We saw this painting as an image capturing the consequences of when we fail to recognize each other’s humanity. As the media shone an unforgiving light on Baltimore, my students recognized Freddie Gray and Shylock were the same in this moment. Both were convicted before the trial ever began. It was understood by everyone that neither Freddie Gray nor Shylock would receive unbiased justice, but it was the status quo’s dehumanizing failure to recognize The Other’s actual right to exist that inspires outrage. In that courtroom, Shylock is not only stripped of his wealth and religion—he is officially stripped of what makes him human, and the court that was meant to deliver impartial justice was positioned to deliver this verdict before Shylock entered the room. Shylock is stripped of his life because he was never considered to be human. Shylock’s rage and fury is captured so well in this image such that it enriches our understanding of the rage and fury that we saw in Baltimore’s Sandtown-Winchester community in April 2015 when a community recognized that for decades Baltimore governmental institutions and elected leaders failed to recognize their voices, their humanity, their pain. Ask the communities that still remain just below boiling point because of the deaths of Trayvon Martin, Eric Garner, Tamir Rice and Sandra Bland. The following week, I divided my seniors into groups of 3-4 and had them do a close-reading exercise using Shylock’s monologues in the play. They first read the speeches to full stops, paraphrased, and annotated for figurative language, imagery, sound, and structure. Although some of Shakespeare’s most eloquent writing exists in verse throughout the play (including Portia’s famous “quality of mercy” monologue in Act IV, scene i), Shylock’s monologues show Shakespeare’s ability to use prose to do some serious heavy lifting in developing the character of Shylock. He packs his speeches full of rhetorical questions, vivid images, parallel structure, and striking metaphors; many of the same tools that we see utilized in some of the prominent speeches that sprouted from the Civil Rights movement. Shylock’s monologues read as pieces of rhetoric–tools for Shylock to make his case for the Venetian community to recognize his humanity and see him as a whole human. A case that goes unacknowledged and unheard in the streets and markets of Venice. In Act III, scene i we see Shylock switching from first-person pronouns to the collective plural pronoun of “we” to suggest that he is not only pleading for the Venetian community to recognize his humanity, he’s also pleading for them to see the pain that was inflicted upon the entire Jewish community at the hands of the Venetian Christians. His monologues are pieces of rhetoric that serve in the name of social justice. Prior to the court scene, Shylock warns the Venetians: “The villainy you teach me, I will execute, and it shall go hard but I will better the instruction” (Act III, scene i). We certainly do not have to condone Shylock’s course but we can certainly understand it and use it to enhance our students’ understanding of the rhetoric used to sustain social justice movements throughout history and the consequences that appear as a direct result of a community feeling that their pain and humanity has gone unrecognized. If we don’t, history teaches us that pain can easily become unmitigated rage. Amber Phelps is in her 6th year of teaching English at Baltimore City College High School. She currently teaches both Literature & Performance and English I in the Diploma and Middle Years Programs within the International Baccalaureate program. Ms. Phelps is an alumna of both Teach for America (Baltimore '10) and the Folger Library’s 2012 Teaching Shakespeare Institute.